B: Matt Stuart: What Was He Thinking? "I had been waiting on this corner where there was a good cross light. So the sun was coming from the left across the street I was facing. I was waiting for people to be lit by the sun whilst leaving the background in shadow. I had been waiting for an hour or so and was feeling very aware of everything happening around me when I saw these three men walking across the pavement and all touching their faces. I cut across the man in the foreground taking one frame which is the one you see. They were gone. I think it is one of the most spontaneous photographs I have ever taken. "This photo is one of my favorites, for various reasons. I like the fact that there are two or three things happening in the shot at the same time. 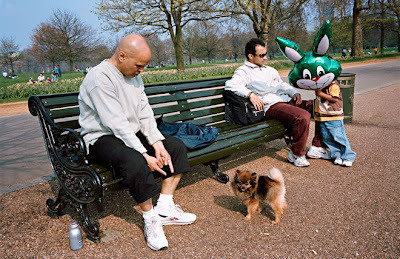 The man pointing at his dog, the dog sticking its tongue out at me and the balloon blowing over the child’s face. I remember when I was shooting this scene that this particular frame everything felt like it had fallen into place at the same time and luckily for me it had. As well as having captured two or three things happening in one shot the most exciting thing about this image for me personally was that I walked into the scene and out of the scene without anybody (apart from the dog!) noticing me. They were all so engrossed in their respective world. 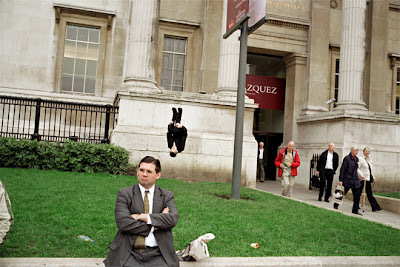 I shot the picture with a 28mm lens on my Leica so I was fairly close to the man in the foreground. I shot around 15 frames of the scene then left and nobody noticed me at all. I felt invisible. This is one of the greatest feelings you can have as a photographer - invisibility." "This picture was taken in one of my favorite spots - Oxford Circus. For anyone who hasn’t been to London it is the busiest shopping street in town and this is the bottle neck in the middle were sometimes it can get so busy that you can’t move. 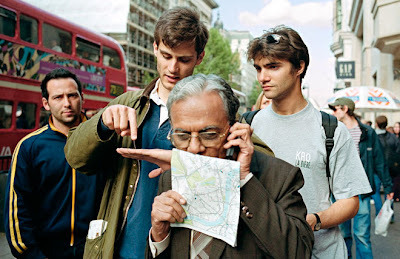 The photo is of 3 tourists (I believe) the man in the foreground, lost and nervous, map in hand and covering his mouth. Followed by two separate tourists young and confident and more than happy to display the route that they have taken. Although they are both separate they have been connected by me the photographer. This was a one frame opportunity. I saw it, shot it, and no time to shoot anything else." "This is one of the first photographs I ever took. It was 1999 and I was 23 and had read in the paper that the Millennium Wheel was going to be erected that weekend. I spent the whole weekend at the site on the River Thames waiting with tourists and enthusiasts to see the wheel go up. I shot hundreds of pictures of which none were any good and I was beginning to think this photography business was rather expensive. Then this old man turned up for about 30 seconds, looked up at the wheel and then nonchalantly rode off. When I saw the picture I freaked! I was all fingers and thumbs. Your brain is like a warship going “action stations! alert alert!” I can still remember the adrenalin and how I had to calm myself down to control my shaking. I flapped behind him shooting as many frames as I possibly could, knowing that it was potentially a very good shot. Only one of the frames worked, all the others were too busy, too light, too dark or too shaky. This was the first time I really felt like a photographer and I knew from that point on that is what I wanted to be." "This is one of my favorite photos and one that I get most compliments on. I shot it in Trafalgar Square. Unusually I didn’t take this photo on a Leica. I was using a Canon film SLR. The Leica was in repair. I knelt down on the step and focused my camera on the white wall in the background. I was hoping to get lots of black legs walking along in various graphic shapes. 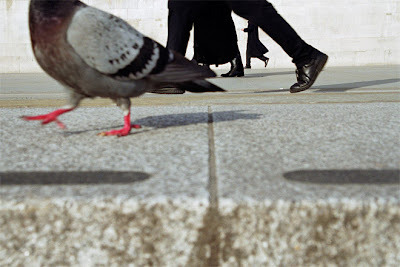 I had been bent over with my bum in the air for about half an hour when a rather confident pigeon walked past. I instinctively shot this frame but as I was doing it I noticed something had happened with the human legs as well. It all happened so quickly that I wasn’t exactly sure what I had got but something felt right. When I received my contact sheets back I was delighted to have found the legs within the legs and the way that the coats mimicked the pigeon's tail. I like to think that humans aren’t the only ones that need to get up early to go to work." "Another shot taken in Trafalgar Square. This, unlike the pigeon photo, was a one frame catch. I walked into the square and saw some school kids watching a man in headphones dancing, he was body popping badly. One of the school kids joined in, body popping really well, getting cheers from his class mates. I got closer to the scene and as the young body popper stopped I heard one of his friends ask him “to do his summersault”. He replied that he would need to practice it first and they both left the commotion and walked over to the grass where he tried doing a somersault. This was his non public attempt. I think this is a good example of being acutely aware of everything that is going on around you and listening. Had I been wearing my ipod (something that I occasionally do to get inspired and feel invisible) I wouldn’t have heard the two boys' conversation and would probably have missed the moment. The thing I like about this frame is it initially appears such an ordinary situation." 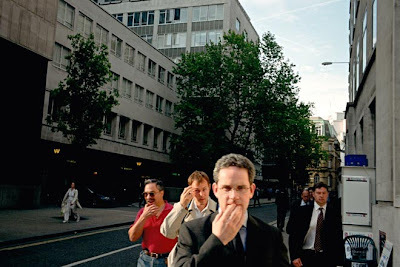 Matt Stuart shoots street photography and commercial work in London. 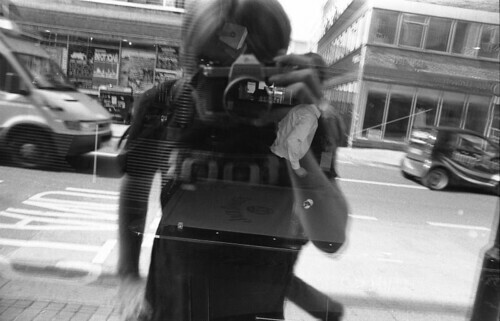 He is a member of In-Public, an online street photography site. More of his photography can be seen on that site, and on his personal site. Stay tuned to this blog in the near future for more Q & A with Matt Stuart. Just a great read. Matt also has a pretty effective picture of the month right now in the in-public website. thank god for good street phtography! 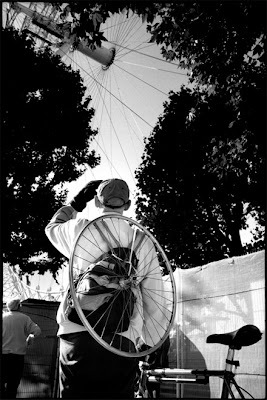 the wheel spoke picture makes me feel pleasantly delirious..
A wonderful post... thanks for sharing! Great read. It is always enjoyable to read or hear a talented photographer explain the outer workings of their images. For a moment it puts all of what we endeavor as image makers back into perspective(at least for me it does). Thanks for posting this - very interesting to get inside the mind like this. Very interesting captures. They really show moments in time that only happen once in a lifetime. I don't understand what's happening in the last picture but that bicycle wheel picture is perhaps one of the best images I have ever seen. Great series of photographs, great narrative. The last image looks like the final impossible microsecond before a body strikes the ground after leaping from a building. I had not seen Matts' wonderful shot before. Some how mine seems similar but some thing is missing. The colour? wow, just wow. Thank you for sharing this, I found your post by following links from his website. Some of the best pictures I have seen recently! It's great to get an insight on how these pictures can to life. Hi Matt, ¡congratulations!, do yu have an amazing work, i´m a mexican photographer, can you take a look in my website? Great and inspiring read. Want to read more about history behind photographs, thanks for sharing. Every time I look at Matt Stuarts images I'm blown away at the amazing moments he's captured. I enjoyed so much reading this post. Thanks. Matt was the first impression I got of Street Photography and my biggest influence. He made me want to go out there and shoot for myself, and definately is the one person who taught me to be 'observant'. Thankyou. It's always great to hear what was actually going on inside someone's head when they're doing stuff like this. I particularly liked the point about the pigeons. Thanks for sharing your thoughts and 'the making of' behind these images. Just shows these sort of captures don't usually happen purely by chance. A brilliant and inspiring photographer telling it like it is. An insightful and intriguing read. I'm back on the streets myself too after a long sabbatical. The funniest and liveliest photography I've ever seen! So real and so positive! Matt has such a great way of seeing the world. Interesting read. Its a great post, some of imageas are very inspirational, thinking is very good and, some points are here that still that are very informative. Thanks for the post. That was really really interesting to read. Thanks for sharing! Thanks for great street photography - I am trying to get some inspiration for future work so thank you for this post! Really awesome. I liked the millennium wheel pic and the pigeon walk the most. The others are good too of course. This is a very good blog. I appreciate very much this text, thank you, let me know so I have moved the article. This blog is really remarkable. Thanks for sharing this great. Keep sharing more useful and conspicuous stuff like this. Thank you so much. Useful post! Great resource here. i appreciate it. I am 15 year's old and i will learn art and photography portfolio after winter because I live art and my faverate subject photography.